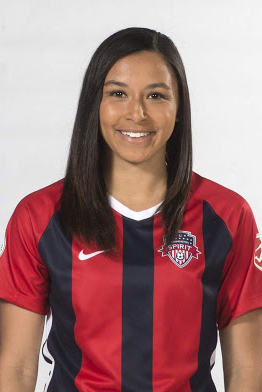 Made U.S. WNT Senior team debut April 8 against Mexico… Has appeared for U.S. U-23 National Team, recording two assists… Attended U.S. U-20 camps in 2016 and traveled with the team for the La Manga tournament in Spain… Participated in U.S. U-19 camp in July 2015, went to U.S. U-18 camp in May 2014… Joined U.S. U-17s for the 2013 CONCACAF Championships… Played for U.S. youth teams in tournaments in Costa Rica and England. Appeared in 72 games, made 61 starts over four years with Stanford… Scored four goals, created 13 assists totaling 21 points, including three game-winning goals. Senior Year: Made 19 game appearances (18 starts)… Tallied 1 goal, 2 assists, and 4 points… Named to the All-Pac-12 first team, All-America third team, MAC Hermann Trophy watch list, United Coaches All-Pacific Region first team. Junior Year: 16 game appearances (15 starts), tallied 5 assists (career high) and 5 points… Member of Stanford 2017 National Championship team… Named to the All-Pac-12 second team. Sophomore Year: Played in all 21 games (19 starts), tallied 1 goal, 3 assists, and 5 points… Earned a All-Pac-12 honorable mention. Freshman Year: Made 16 game appearances (9 starts), scored two goals, created three assists, and seven points… Scored first collegiate goal in OT against Oklahoma (Sept. 13)… Named to Pac-12 All-Freshman team and TopDrawerSoccer Preseason Best XI Freshman Team… Made collegiate debut Aug. 21 at Hawai’i.